Rung in loving memory of Valerie Keel, a ringer here at Wonston for over 30 years. Val, as she was affectionately known, lost her battle with a long illness on April 3rd. District Secretary and latterly as District Treasurer. 1st peal for the Ladies Guild: 1 & 3. 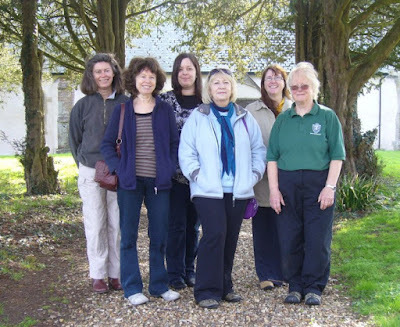 The photo shows the band in ringing order (left to right) with, in the centre, Val's twin sister Mary. member of the choir and former ringer, on the eve of his funeral. Also to coincide with the memorial concert for Leonard Cohen in the Bell Centre, Montreal. Rung by members of the Southern District. 1st peal with Ladies Guild: 1,3. 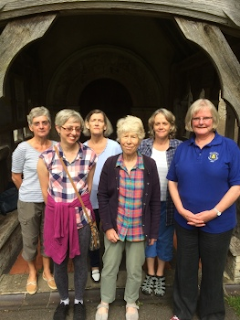 Rung by members of the Southern District (Polly, Patricia, Judith and Christine), with friends from the Western and Eastern Districts (Sheila and Janet). 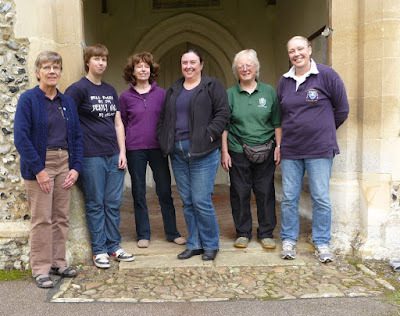 The photo shows the band in ringing order, after a post-ringing lunch in Sutton Scotney. Rung by members of the Ladies Guild, Eastern District to celebrate the 90th birthday of HM Queen Elizabeth II, and also as a compliment for their forthcoming significant birthdays to Betty Baines and Theo Crowder (Ringing Master and Vice-President of the Eastern District) and to the conductor. Also to celebrate the life of Edna Wakeling, long-term friend and neighbour of the treble ringer. 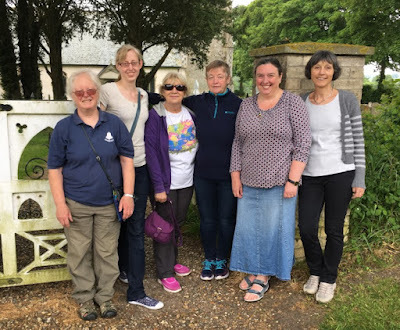 50th peal: 3; first peal for the Ladies Guild: 4 & 6. A compliment to Marina for her forthcoming significant birthday. First peal for the Ladies Guild: 6. 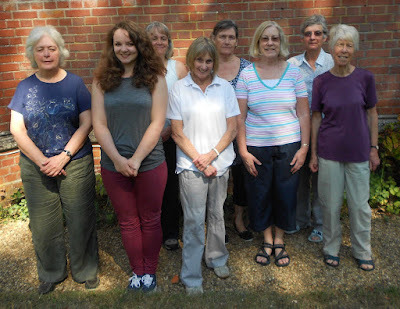 Rung as a 70th birthday compliment to Wendy Godden. Most methods in a peal: 3. 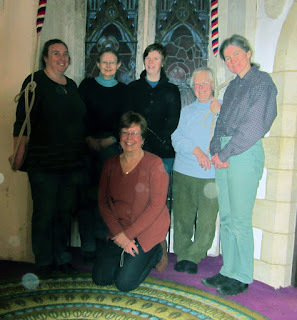 Rung by Cambridgeshire members of the Ladies Guild in loving memory of Tony Baines, husband of Betty Baines, ringing master of the Ladies Guild Eastern District, whose funeral is on 11th February. Rung by members of the Southern District. Rung to mark the Centenary of the Ladies' Guild by a band made up of representatives of each county in the Eastern District. Also to celebrate the Diamond Jubilee of Her Majesty Queen Elizabeth II. Jointly conducted by 5 (exts 1,3,5,7) and 6 (exts 2,4,6). 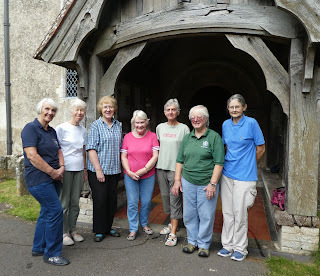 Rung to mark the Centenary of the Ladies' Guild by a band of members of the Eastern District. First peal of Minor: 1. First peal for the Ladies' Guild: 1,3. 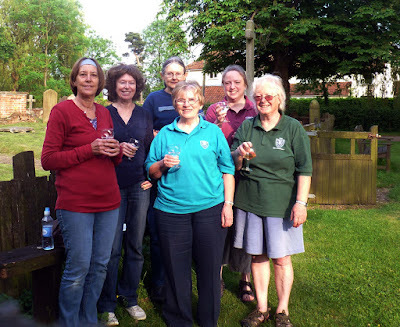 Rung by members of the Southern District to celebrate the Centenary of the Ladies’ Guild. Rung by a band of Ladies’ Guild members from the Eastern District, to celebrate the centenary of the Ladies’ Guild. First peal: 2. First peal for the Ladies’ Guild: 1 & 6. Most methods: 3. First Minor as conductor.